So this year when I parked my car for the winter I thought I did everything right when I stored it and I even laid down some carpet under my car to keep the garage floor moisture from coming up and boy was I wrong. I noticed the underneath of my car is wet to the touch and even inside of the muffler tips are very damp. We have had some crazy weather here in Ohio lately from zero temps up to 60 degrees in just a day and a ton of rain. I have a 3 car garage and we do park our grocery getters in there that come home wet from the snow and rain but I do try to broom out the melted snow that the cars leave but the floors stay wet from that. I'm very concerned of this condensation on my car which could cause rust which I noticed my rotors have surface rust on them already. I cant afford to have a heated garage so what should I do or should have done different? My first thought is that the carpet might actually be making it worse. I wonder if it’s acting like a sponge in a humidor and raising the relative humidity under the car rather than helping to block it. You need a vapor barrier. Replace the carpet with sheet plastic, put plastic under the carpet or use nothing at all (I vote for nothing). Second that... nothing. I live in Colorado and our daily is in and out of the garage and we get wild swings in temps, though our overall humidity is fairly dry. Never seen any issue with condensation on or around any car I’ve owned here. Loose that “rug” under for sure. Sorry guys, it was 84 here yesterday! No hibernation issues in N. Florida. Just buy a roll of Tyvek. It’s a moisture barrier. Lay it down and then roll your carpet over it and park on top. Also, buy a dehumidifier and plug it in. Drill a hole in the wall and route the drain tube from the dehumidifier to the outside. You can get yourself a little pump that will automatically turn on and off to drain the reservoir of the dehumidifier and run the hose from there to somewhere outside. My basement dehumidifier has such a setup. 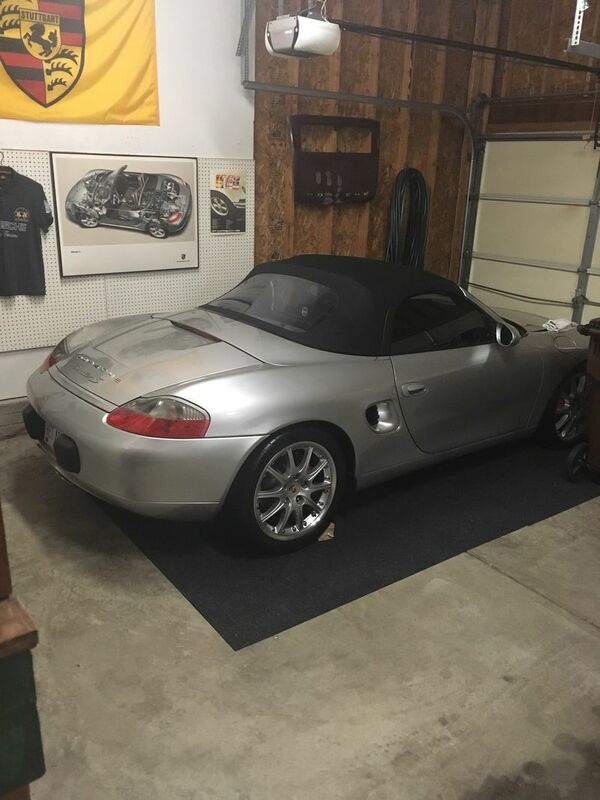 As far as I'm concerned your Boxster should be by itself in a garage or barn "like I did" with mine and forgotten for the winter. All these cars you bring in are the culprit, the engines are hot the garage is cold and this forms humidity. the best is like 10/10ths said buy a roll of Tyvek and lay it on the floor. If I were you I would also insulate that garage. Thanks all for the advise. Has anybody ever use a car capsule or bubble some call it? I'm just curious if that's a waste of money. Originally Posted by Jay B. You'd be better off using the money to buy a heater for the garage. My gas heater in my 3 car garage is about $20/month to run and keep the garage at 60 all winter. Yes, the initial cost was about $2,500. Your Boxster is getting wet from condensation, so what it is sitting on will make no difference. What's going on is that when you drive the other car into the garage and close the door, the other car will be warmer than the ambient air and both warm it up and also saturate it with moisture. Your Boxster is till at the original ambient temperature and the moisture will condensate on it until the dew point is lower than the Boxster temperature. The cure is to keep the garage well ventilated so the Boxster isn't wet for long periods of time. The effect is the same as when you leave the garage on a humid day after a cold night. Your car fogs up immediately and doesn't clear up until the temperature gets above the dew point. Using capsules is fraught with risk. If the capsule isn't sealed 100% moisture will get into it and stay there for a long time. I think this is an invitation for us poor cold northerners to store our cars here for the winter. Hi - I have used a bubble for the last 15 years or so, first for my 356s and now for my 986. It’s perfect! It keeps the car dry, circulates the air, keeps critters and weather out. Looks kind of silly, but very effective. It’s paid for itself by eliminating storage costs. I am in Michigan and we have worse weather than Ohio. My 2002 is in the bubble, in my garage, from mid Nov until mid April. Good luck. Couldnt you try a dehumidifier in the garage to try and pull some of the moisture also? Just a suggestion, in N. Florida our electronics rooms needed one. Third that. Plastic barrier will block moisture. Position plywood under the tires & over inflate them to prevent flat-spotting. I've been doing that for six years now, and working great. Also, get some dessicant packs (like in the shoe boxes), and out a couple in the passenger compartment and one each in trunk and frunk to absorb excess dampness. A dehumidifier is NEVER going to be able to keep up, nor operate properly in that cold environment. I always put a vapor barrier under my car. Ditch the carpeting, or just keep it under the trees only. The carpet will hold moisture. I just use plastic sheeting duct taped to the garage floor. It will allow air to circulate under the car. A lot of good advice here from previous comments!